This mindfulness retreat is resulted by the popular request of participants who took my other workshops. Research shows that mindfulness meditation and a mindfulness-based approach in life enhance the well-being, physical, emotional, and mental health of all, including, of course, practitioners, educators, and even administrators. 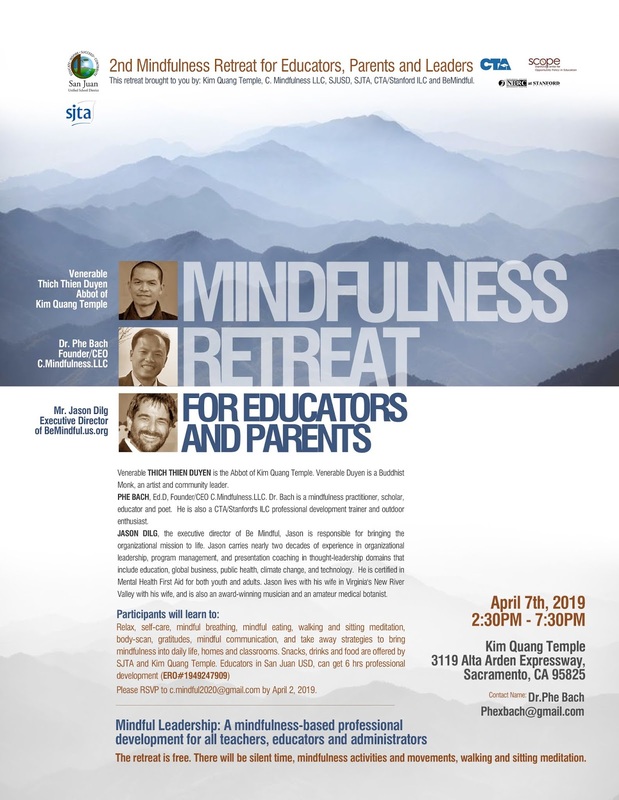 These workshops introduce the research and practices of a mindfulness-based approach in the classroom that will help teachers and students manage their emotional and mental stress, increasing their well-being and refreshing their energy. They are designed for all teachers, educators, and administrators, and will lead the practitioners to be more mindful and compassionate individuals. Our entire educational system needs to be more mindful and holistic--let us begin with ourselves and our classrooms. These workshops will also offer practice-based strategies and techniques such as mindful movement, meditative exercises, and sharing best practices based on evidence from current research. They also require participants to wear comfortable clothing, have a willingness to self-reflect and be open-minded individuals. This mindfulness-based professional development course hopes to transform individuals and the classroom climate while building positive, nurture interpersonal relationships. The workshop series also offers a blueprint for better living, towards harmony and peace in the individual, community and society through Spirituality and Mindful Leadership. "What is mindfulness?" You might asked. It is a skillset and a practice to have a calmer you. Mindfulness gives us space between our emotions and our responses. Mindfulness means paying attention at the present moment, with kindness, compassion and patience, to what is going on inside and outside of you, and without any judgement. Mindfulness helps calm your “monkey mind”, which is often restless, agitated and distracted. A goal of mindfulness practice is to calm the constant chatter of our 'monkey mind', connect your body, heart and mind, to see things clearly, and to be more awareness with a harmony and peaceful outcome that benefit ourselves and others, not only in the now, but also in the future. Over the past 6 years, I work with the district and SJTA as part of the CTA/Stanford/SCOPE (Instructional Leadership Corps) to offer mindfulness workshops for San Juan educators and throughout California. Due to the popular demand, we are offering this mindfulness retreat for educators and parents in our district and others. I thought that we, as staff, would benefit from this unique experience. Participants also get 6hrs of PD. The space is limited, so register early if you can. The ERO number is 1949247909. We'll learn about mindfulness. The retreat information is on the poster. Please spread the words. Thank you for your support. May we all be safe, well, at ease and happy. "Chánh niệm là gì?" Bạn có thể hiếu kỳ. Chánh niệm là một kỹ năng và một thực tập để chúng ta có thể bình tĩnh hơn. Chánh niệm cho chúng ta không gian giữa những cảm xúc, cảm thọ và phản hồi của mình. Chánh niệm có nghĩa là chú ý vào giây phút hiện tại, với lòng tử tế, từ bi và kiên nhẫn, với những gì đang xảy ra quanh ta và trong ta, mà không có sự phán xét, lo âu hay sợ hãi. Chánh niệm giúp làm dịu "tâm khỉ" của bạn, thường là bồn chồn, bực bội và phân tâm. Mục đích của việc thực hành chánh niệm là làm 'tâm khỉ' của mình dịu lại và bình tĩnh hơn, cũng như kết nối thân-tâm (cơ thể, trái tim và tâm trí) của bạn, để nhìn rõ mọi việc, và nhận thức tốt hơn với một kết quả hòa hợp và an bình làm lợi cho mình và cho người, ngay bây giờ và cho cả tương lai. Trong 6 năm qua, tôi làm việc với Học Khu San Juan và Hiệp hội giáo chức San Juan như là một phần của CTA/Stanford/SCOPE ILC (Instructional Leadership Corps) để tổ chức các buổi hội thảo về chánh niệm cho các nhà giáo ở Học khu San Juan và khắp tiểu bang California. Do nhu cầu phổ biến, chúng tôi lại mở thêm Khoá bồi dưỡng chánh niệm này cho các nhà giáo dục và phụ huynh ở Sacramento và các vùng phụ cận. Chúng tôi thiết nghĩ, tất cả chúng ta sẽ được lợi lạc lợi từ trải nghiệm độc đáo này. Những giáo viên trong học khu San Juan tham gia cũng sẽ được 6 giờ cho PD (phát triển chuyên môn). Không gian có giới hạn, vì vậy hãy đăng ký sớm nếu bạn có thể. Số ERO là 1949247909. Chúng ta sẽ học về chánh niệm, học cách tự chăm sóc mình. Xin vui lòng chia sẻ cho những ai có thể cần khoá bồi dưỡng này. Mọi chi tiết của khoá bồi dưỡng nằm ở phần poster. Thành thật cảm ơn sự hỗ trợ của các bạn. Cầu mong cho tất cả chúng ta được an toàn, bình yên, thoải mái và hạnh phúc. Why Aren't We Teaching You Mindfulness? | AnneMarie Rossi Tại sao chúng ta không dạy bạn Chánh niệm? Harvard conducted a research study and they tracked more than 1,000 people from birth until age 32 looking for what made someone successful. What common characteristic or trait was seen in a successful individual? It wasn't their race, what language they spoke, what neighborhood they grow up in, or how much money their parents had. It wasn't how well they did on standardized tests or even their IQ. It was self-control; those who were successful, who had good careers, financial stability, loving relationships, and physical health. Those who were successful, were the ones who could focus, pay attention, and regulate their emotions. They were the ones to practice mindfulness. It doesn't matter if I give you all the shiniest new iPads, and Stephen Hawkings is teaching you math; if you can't focus and pay attention, how well will you do? Mindfulness is the foundation for all other learning, for all success you will have throughout your entire life. So I ask you, why, if we know that this is the single most important predictor of success for human beings, why aren't we teaching it to you? Mindfulness exercises are designed to train your brain to have focus, attention, and emotional regulation. There's mindful listening, eating, breathing, movement; it's a way of engaging in the present moment, without attachment and without judgment. Mindfulness is grounded in more than 30 years of scientific study. Most major universities in the world, Harvard, MIT, Stanford, Yale, Oxford and Cambridge, just to name a few, teach and/or research this practice. In fact, Oxford has a Master's Degree in Mindfulness. This isn't religion, this isn't hippie nonsense, and this isn't some idea I came up with in my backyard. This is science. There exist literally thousands of studies that show us that mindfulness practice decreases depression, anxiety, and stress; increases overall feelings of well-being, happiness, focus, attention, and academic achievement. So, I ask you again: why if we know this, why aren't we teaching mindfulness to you? We are inundated with distractions: our phones, our tablets, all the sights and sounds that surround us; the never-ending dialogue our brain is having with itself. The ability to focus on one thing at a time for an extended period is a skill and it requires practice. You all know what I'm talking about. You're sitting in your class, and you're pretty sure you heard the teacher say the words 'important' and 'quiz'. But then, that girl you met over the weekend texted and while you have to respond, you want to sound cool and interested (but not too interested, I mean you're not desperate). And then a breeze blows through the window and…whoa, what is that smell? Has that girl always been in this class? She's got pretty hair. Man, I like a girl that smells good! Wait, do I smell good? Did I put on deodorant today? Am I sweating? And then the bell rings and you have missed all of class and you definitely have absolutely no idea what's important and what's on the quiz. The ability to turn your attention to the class, to focus on something that frankly might not be that interesting (like algebra), it's a skill, and it requires practice. Really? That is so strange because I'm pretty sure Kobe Bryant already knows how to play basketball but he’s still practicing! Mindfulness isn't just about the ability to focus and pay attention, it's also able to feel emotions like pain, anger, frustration, anxiety, and fear and not react to them. Mindfulness gives us space between our emotions and our responses so that we can actually think first. Sometimes we forget that our emotions are ever-changing, that joy and pain come and go like ocean waves. Mindfulness allows us to surf rather than drown. And sometimes we forget that we're not the only ones feeling pain. Look around the room; look at the person next to you, in front of you, behind you. They have all experienced pain. Every one of you has all experienced pain. Pain is inevitable. Suffering? Well, that's a choice. We may not be able to choose all the uncontrolled circumstances that life presents with us any more than we can choose the weather, right? But we can choose not to be victims to our circumstances because we can choose our reactions. Pain and anger, well, they’re just not good excuses because they're a part of every human experience. If we respond to anger with anger, we only make the situation worse. The harsh truth is that it doesn't matter how righteous and justifiable your emotions may be, it is irrelevant because you'll be judged based on your reactions and not your reasons. Mindfulness allows us to be reflective and not reactive. It's not about running from our emotions or not feeling our emotions; it's allowing us to not be overwhelmed by our emotions. It's not about controlling our thoughts and emotions, but rather not having our thoughts and emotions control us. I have two teenagers. I teach teenagers and I was once, 900 years ago, a teenager myself. The struggle to deal with your emotions is real and overwhelming. The part of the teenage brain that regulates emotions, that hasn't fully yet developed. But the part that feels emotions, that's the size of a full grown adult. So something small can really easily turn into something big. You're walking in the hallway and you see your friend, they look right at you, and you're like, "Hey, what's up? ", and they ignore you like a Casper. So you walk into your next class, and you spend the entire time trying to figure out why this person hates you now. You've texted all of your other friends, and nobody's responded. You've replayed the last three conversations you had with them in your head and you still have no idea what went wrong. So you decided that, well, you hate them too, now. I mean, who are they to ignore you, right? Or you decided that, well, gosh, they ignored you and nobody's responded to any of your text messages, and man, this must mean that actually nobody likes you and really, you don't have any friends, and no one's ever going to love you, and you're definitely going to die alone with a hundred cats. Look this right here; this is called taking a left turn down crazy lane. And we are all guilty of it. Mindfulness allows us to stop at the intersection of reality and crazy lane; choose which path we want to go down. With all of the no needs and benefits of mindfulness practice, I ask you again, why are we not teaching it to you? Well, part of that is because for a long time, mindfulness practice has been a privilege offered in well-funded schools or through expensive individual instruction. CEOs, celebrities, world famous athletes, they flock to the trainings, paying as much as 10,000 dollars to learn the secrets of success. It's important that we have mindful leaders, but we are missing great thinkers, innovators, and doers, those who can't afford to pay for the skills required to succeed. Do we really think all the best and brightest happen to be born with money? And what about those born in poverty, I mean poverty is traumatic. We're born into generational poverty, whose parents and grandparents, aunts, uncles, sisters, and brothers all live in poverty. They're surrounded by the trauma of poverty and stress to contagious disease. It doesn't just affect the adults, it affects everyone living in the home. We know that poverty is traumatic, we know that trauma changes the brain and so without practices like mindfulness, gifted children are left behind. I believe that mindfulness practice should be offered in every school, in every county, in every district, in every state. It shouldn't be about whether or not your parents can afford the instruction or they can afford to move you to the right ZIP code in the right school district. I believe that mindfulness practice can reverse generational poverty, and we can move kids up and out. I had a fourth grade student who grew up in generational poverty. His parents were in and out of prison, drug use, he was considered a trouble maker, academically behind, he even had to repeat a grade. He would get so frustrated, he would throw his desk across the room, run out of the classroom building, out of the school, and all the way down the street multiple times a week. Now, two years later, he practices mindfulness every day. He has no more classroom or behavioral issues, and he's in the gifted and talented program. He would tell you that it wasn't until someone taught him how to deal with his emotions, that someone taught him mindfulness practice, that he was able to change his whole life. We know one of the number one predictors for a student dropping out of high school is behavioral issues. We know that if you drop out, you're four times more likely to live in poverty. So we create these very specific rules and consequences, but do we really think little Timmy doesn't know he shouldn't poke little Tommy in the eye? Or does he not know how to stop himself? Has he never learned how to manage his emotions? And for some, those emotions can become so overwhelming they can feel permanent. Suicide is the third leading cause of death in children ages 10-24. 4,800 succeed in taking their own lives every year and 157,000 are treated for self inflicted injuries, just in the US. In a study looking at 320 schools, students ages 13-17, they found that nearly half--49.5%--met the criteria for suffering from at least one mental health issue: anxiety, depression, ADHD, eating disorders. We know that schools are the number one provider for support for students. We know you're struggling. We know that mindfulness works. So I ask you again, why aren't we teaching it to you? It's with this in mind that I conducted a research study with the University of Colorado in Denver on the impacts of mindfulness instruction on fourth grade students in a low-income school here in Denver. We looked at the teachers' perception of the students' ability to regulate their emotions, engage in pro-social behaviour, and academic achievement. Those students who went through mindfulness practice scored 250% higher on emotional regulation, 600% higher on pro-social behaviour, and 550% higher on academic achievement than those who did not go through the class. We then asked the students, well, what do you think of mindfulness class? 100% anonymously self-reported that they enjoyed the class, they benefited from the practice, they will continue to do it, and they believe all other children should learn it. They saw the greatest improvements in their ability to calm down, focus, and avoid fights, as well as feeling happier at school and at home. The teacher rated the class a 10 out of 10 and said that she believed mindfulness instruction actually led to an increase in teaching time between 11 and 20 minutes. Mindfulness practices are exercises designed to help you become a more mindful human being; one who can focus and pay attention and miss a distraction, one who can feel intense emotions and rather than react, reflect and respond. Mindful listening? Man, that's going to be important to every relationship you ever have for your entire life. Mindful eating? That's going to determine your physical and mental health. And mindful breathing allows you to find calm and focus, peace in a chaos. These practices ultimately lead to compassion, generosity, kindness, altruism. We need the world to be more mindful, we need you to be more mindful. First, you have to decide that you want to be the change that you want to see in the world and then go about being it. Throughout this talk, I've asked you why you aren't being taught mindfulness. I will end with asking you to take personal responsibility for your life. If you believe, as I do, as many, many, many others do, that the path to your success, the path to a better world, lies in the practice of mindfulness, then ask your teachers and administrators to bring in experts to give you the skills that you need to have to succeed. You need to take ownership over your future. Change will happen; by choice, not by chance. We will change the world, one mind at a time. And it starts with yours. Thay lời giới thiệu: Chánh niệm cho chúng ta không gian giữa những cảm xúc và phản ứng của mình. Chánh niệm có nghĩa là phải giành sự chú ý, với lòng tử tế và kiên nhẫn, với những gì đang xảy ra bên trong và bên ngoài của bạn ngay bây giờ. Thuật ngữ "tâm khỉ" có nghĩa là cảm thấy bồn chồn, điên cuồng và phân tâm. Mục tiêu của sự thực hành ý thức là làm dịu sự nhạo báng của cái “tâm khỉ” này. Harvard (trường đại học nổi tiếng ở Hoa Kỳ) đã tiến hành một nghiên cứu, và họ xem xét hơn 1000 người từ khi sinh ra cho đến tuổi 32, để tìm hiểu những tính cách và nhân tố đã giúp họ thành công. Tính cách hay những điểm chung nào đã tìm thấy ở một cá nhân thành công? Kết quả cho thấy, không phải là chủng tộc, ngôn ngữ, nơi họ đã lớn lên, hay bố mẹ họ có bao nhiêu tiền. Cũng không phải là họ đã làm tốt như thế nào trên các bài kiểm tra tiêu chuẩn, hoặc chỉ số thông minh IQ của họ. Điểm Chung đó là sự tự chủ. Những người thành công là những người có sự nghiệp tốt, ổn định tài chính, có những liên hệ yêu thương, có sức khoẻ. Những người thành công là những người có thể tập trung, biết cách chú ý, và kiểm soát tốt cảm xúc của họ. Họ là những người thực hành chánh niệm. Chẳng có gì là quan trọng nếu tôi đưa cho bạn những chiếc iPad đời mới, hoặc Stephen Hawkings dạy bạn toán học. Nếu tự bạn không thể tập trung và chú ý, liệu bạn sẽ làm tốt như thế nào? Chánh niệm là nền tảng cho mọi việc học khác, cho tất cả thành công bạn sẽ có trong suốt cuộc đời. Vì vậy, tôi hỏi bạn, nếu chúng tôi biết rằng đây là một chỉ báo quan trọng nhất cho sự của thành công của một người, tại sao chúng tôi không truyền đạt cho bạn? Các bài tập chánh niệm được thiết kế nhằm luyện não của bạn tập trung, chú ý và kiểm soát cảm xúc. Có chánh niệm trong lúc lắng nghe, trong lúc ăn, thở, hay đi lại; đó là một cách để sống với khoảnh khắc hiện tại, không có sự luyến ái và không có sự phán xét. Chánh niệm được dựa trên hơn 30 năm nghiên cứu khoa học từ nhiều nơi trên thế giới. Hầu hết các trường đại học lớn trên thế giới như trường đại học Harvard, MIT, Stanford, Yale, Oxford và Cambridge v.v… (đây chỉ nêu những trường tiêu biểu) đều đã nghiên cứu, giảng dạy và ứng dụng những phương pháp thực tiễn này. Hiện nay, Trường đại học Oxford có bằng Thạc Sĩ về Chánh Niệm. Đây không phải là tôn giáo; đây không phải kiểu ‘hippie’ vô nghĩa; đây không phải là một vài ý tưởng ngẫu nhiên mà tôi tự nghĩ ra ở sau vườn nhà. Đây là khoa học. Có hàng nghìn nghiên cứu cho thấy rằng thực hành chánh niệm làm giảm trầm cảm, lo lắng và căng thẳng; làm tăng cảm giác hạnh phúc, an lạc, sự tập trung, sự chú tâm, và khả năng đạt thành tích tốt trong học vấn. Vì vậy, tôi hỏi bạn một lần nữa: Nếu chúng tôi biết điều này, tại sao chúng tôi không truyền đạt chánh niệm cho bạn? Chúng ta bị tràn ngập bởi những thứ làm tâm phân tán: điện thoại, máy tính xách tay, những cảnh quan, tiếng động xung quanh chúng ta; những tiếng nói thầm thì không bao giờ ngưng trong bộ não của chúng ta. Khả năng tập trung vào một việc trong một thời gian dài là một kỹ năng, và nó đòi hỏi sự luyện tập. Bạn đều biết tất cả những gì tôi đang nói ở đây. Tưởng tượng bạn đang ngồi trong lớp học, và bạn tưởng chắc rằng bạn đã nghe giáo viên nói những từ 'quan trọng' và ' bài kiểm tra'. Nhưng sau đó, cô gái mà bạn gặp vào cuối tuần nhắn tin cho bạn. Và trong khi bạn phải trả lời, bạn muốn tỏ ra mình “ngầu” và đáng được chú ý, nhưng không quá quan tâm đến cô gái, nghĩa là thể hiện không quá si mê. Và sau đó là một cơn gió thổi qua cửa sổ, và ối chà! Đó là mùi hương gì vậy? Cô gái đó có mặt ở trong lớp này không? Cô ấy có mái tóc đẹp. Trời ơi, tôi thích các cô gái có mùi thơm lừng! Và rồi chuông reo lên. Bạn đã bỏ lỡ tất cả những gì giáo viên đã giảng trong lớp, và bạn hoàn toàn không nắm những gì quan trọng, và những gì sẽ có trong kỳ kiểm tra. Khả năng đặt sự chú ý của bạn trong lớp học, tập trung vào một cái gì đó, thẳng thắn mà nói không thú vị cho lắm (giống như môn đại số). Nó là một kỹ năng, và nó đòi hỏi phải luyện tập. Chánh niệm giúp ta có thể đạt được điều này. Tôi thấy buồn cười khi có người nói với tôi rằng họ không cần phải thực hành chánh niệm, "Ồ, tôi có sẵn cái này!" Thực vậy không? Điều này thật lạ lùng, vì tôi biết rằng Kobe Bryant dù đã chơi bóng rổ giỏi như thế nào, nhưng anh ấy vẫn tập luyện. Anh ta cũng thực hành chánh niệm. Chánh niệm không chỉ là khả năng tập trung và chú ý. Mà nó còn là khả năng có thể cảm nhận được những cảm xúc như đau đớn, tức giận, thất vọng, lo lắng, sợ hãi, nhưng không phản ứng với chúng. Chánh niệm cho chúng ta khoảng cách giữa cảm xúc và phản ứng, để chúng ta thực sự có thể suy nghĩ trước khi hành động. Đôi khi chúng ta quên rằng cảm xúc của chúng ta luôn thay đổi. Niềm vui và nỗi đau đến và đi như sóng biển. Chánh niệm cho phép chúng ta lướt sóng, chứ không phải để chúng nhấn chìm. Và đôi khi chúng ta quên rằng chúng ta không phải là những người duy nhất cảm thấy đau đớn. Nhìn xung quanh căn phòng, nhìn vào người đang ngồi bên cạnh bạn, trước mặt bạn, phía sau bạn. Tất cả đều đã trải nghiệm sự đau đớn. Mỗi người trong các bạn đều có kinh nghiệm về sự đau đớn. Sự đau đớn là không thể tránh khỏi. Còn đau khổ thì sao? Xin thưa, đó là một sự lựa chọn. Chúng ta không thể lựa chọn tất cả những hoàn cảnh ngoài tầm kiểm soát mà cuộc sống đang mang đến cho chúng ta, giống như thời tiết. Có đúng vậy không? Nhưng chúng ta có thể lựa chọn không trở thành nạn nhân của ngoại cảnh, bởi vì chúng ta có thể chọn cách thức phản ứng. Đau đớn và giận dữ (của người khác), chúng không phải là cái cớ chính đáng, vì đó là một phần của trải nghiệm của mỗi con người. Nếu bạn phản ứng trước sự giận dữ bằng sự giận dữ, bạn chỉ làm cho tình hình tồi tệ hơn. Sự thật đau lòng ở đây là việc cảm xúc của bạn hợp lý và có thể lý giải được lại không phải là vấn đề quan trọng. Bạn chỉ được đánh giá qua phản ứng của bạn, chứ không phải bởi lý do của chính bạn. Chánh niệm cho phép chúng ta quán chiếu và không phản ứng tức thì. Nó không phải là xa lánh cảm xúc hay không cảm nhận được cảm xúc của chúng ta. Nó cho phép chúng ta không bị choáng ngợp bởi những cảm xúc dồn dập của chính mình. Nó không phải là việc kiểm soát những suy nghĩ và cảm xúc của chúng ta, mà là không để cho ý nghĩ và cảm xúc của điều khiển chúng ta. Tôi có hai đứa con ở tuổi teen. Tôi dạy những người ở tuổi teen, và chính tôi cũng đã từng ở độ tuổi này vào 900 năm trước! Cuộc đấu tranh để đối phó với cảm xúc của bạn là có thật và mạnh mẽ. Một phần bộ não của tuổi teen dùng để điều khiển cảm xúc, nó vẫn chưa hoàn toàn phát triển. Nhưng phần não cảm nhận được cảm xúc, nó lại rất trưởng thành. Vì vậy, một chuyện gì dù nhỏ vẫn có thể dễ dàng biến thành một vấn đề to tát. Bạn đang đi bộ trong hành lang trường, và bạn nhìn thấy một người bạn của mình. Người này nhìn thẳng vào bạn, và bạn đang sắp nói "Hê, sao rồi bạn? ", nhưng người bạn này lại phớt lờ bạn như một người xa lạ (Casper). Vì vậy, khi bạn bước tiếp vào lớp học, bạn dành toàn bộ thời gian để tìm ra lý do tại sao người này ghét bạn. Bạn đã nhắn tin cho tất cả bạn bè khác và không ai trả lời. Bạn soát lại trong đầu ba cuộc đàm thoại cuối cùng mà bạn gặp với người đó, nhưng bạn vẫn không biết đã làm gì sai. Vì vậy, bạn đã quyết định rằng: tốt thôi, bây giờ mình cũng ghét lại người đó. Người đó là ai mà dám làm lơ bạn, phải không? Thật hiển nhiên. Đúng không? Rõ rồi nhé. Nhìn thẳng ở đây, điều này được gọi là bước rẽ trái dẫn xuống lối mòn tiêu cực. Và tất cả chúng ta đều đã phạm lỗi này.Chánh niệm cho phép chúng ta dừng lại tại ngã tư giữa thực tại và lối mòn điên rồ; hãy chọn con đường nào chúng ta muốn đi. Với tất cả những lợi ích không bàn cãi của việc luyện tập chánh niệm, tôi hỏi bạn một lần nữa, tại sao chúng tôi không giảng dạy nó cho bạn? Vâng, câu trả lời một phần là bởi vì trong một thời gian dài, thực hành chánh niệm đã là một đặc quyền ở các trường học có nguồn tài chính tốt, hoặc thông qua những cá nhân có điều kiện tốt về tài chính. Những CEO, những người nổi tiếng, vận động viên nổi tiếng thế giới, họ tham gia vào các khoá huấn luyện, và trả 10,000 đô la để học bí quyết thành công. Điều quan trọng là chúng ta có những nhà lãnh đạo có tri thức. Nhưng chúng ta bỏ sót những nhà tư tưởng vĩ đại, những nhà đổi mới và những người hành động nhựng không có khả năng chi trả để học kỹ năng cần thiết để thành công. Liệu chúng ta có thực sự nghĩ rằng tất cả những điều tốt nhất và sáng ngời nhất được sinh ra bằng tiền? Còn những người sinh ra trong cảnh nghèo đói thì sao? Nghèo đói là một nỗi ám ảnh. Chúng ta sinh ra trong cảnh đói nghèo suốt các thế hệ, có cha mẹ và ông bà, cô chú bác, dì dượng, anh chị em và anh em, tất cả đều sống trong nghèo đói. Họ đang bị bao vây bởi ám ảnh về sự đói nghèo và căng thẳng với bệnh truyền nhiễm. Nó không chỉ ảnh hưởng đến người lớn, nó ảnh hưởng đến mọi người trong gia đình. Chúng ta biết rằng nghèo đói là nỗi ám ảnh, chúng ta biết rằng sự ám ảnh thay đổi bộ não. Và do đó nếu không có thực tập như chánh niệm, trẻ em có năng khiếu sẽ bị tụt lại phía sau. Tôi tin rằng thực hành chánh niệm phải được giảng dạy ở mọi trường học, ở mọi hạt, ở mọi quận, mọi tiểu bang. Không cần đặt câu hỏi có nên hay không nữa - (Tiếng vỗ tay) Cảm ơn bạn. Nó không phải là về việc cha mẹ bạn có thể đủ khả năng cho con ăn học, hoặc họ có thể đủ khả năng để chuyển nhà đến những quận có mã vùng có trường học tốt. Tôi tin rằng thực hành chánh niệm có thể đảo ngược sự nghèo khó qua các thế hệ, và chúng ta có thể đẩy bọn trẻ đi lên và đi xa hơn. Tôi có một học sinh lớp bốn, lớn lên trong nghèo đói. Cha mẹ em ấy ra vào nhà tù vì sử dụng ma túy. Em đã bị coi là kẻ gây rối, việc học tụt hậu, em thậm chí đã phải ở lại một lớp. Em ấy cảm thấy nản lòng, đã bỏ lớp học, ra khỏi trường,và lang thang trên đường phố nhiều lần trong một tuần. Bây giờ, sau hai năm, em đã thực hành chánh niệm mỗi ngày. Em không còn có vấn đề về hành vi trong lớp học nữa. Và em đang học trong chương trình dành cho trẻ có tài năng, thiên khiếu. Em ấy sẽ nói với bạn rằng, chỉ đến khi có người dạy em cách đối phó với cảm xúc của mình, có người đã dạy em thực hành chánh niệm, từ đó cuộc đời của em đã thay đổi hoàn toàn. Chúng ta biết một trong những vấn nạn chính khiến học sinh bỏ học ở bậc trung học, là vấn đề hành vi. Chúng ta biết nếu bỏ học, nguy cơ sống trong nghèo đói tăng gấp bốn lần. Vì vậy, chúng ta đã tạo ra những quy định và hậu quả rất cụ thể. Nhưng chúng ta có thực sự biết rằng Timmy bé nhỏ không biết tại sao em không nên chọt vào mắt của mình? Hay em không biết làm thế nào để tự ngăn chặn mình? Em ấy đã bao giờ học cách kiểm soát cảm xúc của mình chưa? Và đối với một số người, những cảm xúc trở nên tràn ngập đến nỗi họ cảm thấy chúng tồn tại vĩnh viễn. Tự sát là nguyên nhân thứ ba gây tử vong ở trẻ em từ tuổi 10-24. Có 4,800 người đã tự kết liễu cuộc sống của mình. Và mỗi năm 157,000 người đã được điều trị cho các thương tích do tự mình gây ra, theo thống kê ở Mỹ. Trong một nghiên cứu tại 320 trường học với học sinh từ 13-17 tuổi, cho thấy rằng gần một nửa, 49,5% có vấn đề ít nhất là về sức khoẻ tâm thần: Lo lắng, trầm cảm, ADHD, rối loạn ăn uống. Chúng tôi biết rằng trường học là nhà cung cấp số một để hỗ trợ sinh viên, chúng tôi biết bạn đang phải đấu tranh với vấn đề này. Chúng tôi cũng biết rằng chánh niệm là giải pháp hiệu quả cho vấn đề. Vì vậy, tôi hỏi bạn một lần nữa, tại sao chúng ta không giảng dạy nó cho bạn? Với ý nghĩ như vậy, tôi đã tiến hành một nghiên cứu với Đại học Colorado ở Denver, về những tác động của việc hướng dẫn chánh niệm cho học sinh lớp bốn trong một trường học có thu nhập thấp ở Denver. Chúng tôi muốn giáo viên nhận thức về khả năng điều khiển cảm xúc của học sinh, hành vi thích ứng với xã hội và thành tích học tập của chúng. Những học sinh đã trải qua lớp thực hành chánh niệm đạt được 250% cao hơn về kiểm soát cảm xúc, cao hơn 600% về hành vi thích ứng với xã hội, và 550% cao hơn về thành tích học tập so với những người không trải qua lớp thực hành. Sau đó chúng tôi hỏi các học sinh: bạn nghĩ gì về lớp chánh niệm? 100% cá nhân báo cáo rằng họ thích các lớp, họ được hưởng lợi từ việc luyện tập, họ sẽ tiếp tục làm việc đó, và họ tin rằng tất cả những đứa trẻ khác nên học nó. Họ nhìn thấy những tiến bộ lớn về khả năng bình tĩnh, tập trung, và tránh tranh cãi, cũng như cảm thấy hạnh phúc hơn ở trường học cũng như ở nhà. Giáo viên đánh giá lớp 10 trên 10 ,và nói rằng cô ấy tin rằng sự hướng dẫn chánh niệm thực sự làm tăng thời gian giảng dạy từ 11 đến 20 phút. Thực hành chánh niệm là những bài tập được thiết kế để giúp bạn trở thành một con người ý thức hơn, người có khả năng tập trung và chú ý, và biết bỏ qua cái làm phân tâm. Một người có thể cảm nhận những cảm xúc mãnh liệt hơn là đáp trả, phản xạ, và đáp ứng. Lắng nghe chánh niệm? Đó sẽ là điều quan trọng đối với mọi mối quan hệ trong cuộc đời của bạn. Ăn trong chánh niệm? Điều đó sẽ quyết định sức khoẻ thể chất và tinh thần của bạn. Và chánh niệm hơi thở cho phép bạn tìm thấy sự tĩnh lặng và tập trung, bình lặng trong những lúc hỗn loạn. Những thực hành này sau cùng sẽ dẫn đến lòng trắc ẩn, rộng lượng, tử tế, và vị tha. Chúng ta cần cả thế giới chánh niệm hơn nữa. Chúng tôi cần bạn phải chánh niệm hơn. Trước tiên, bạn phải quyết định rằng chính bạn muốn thay đổi như bạn muốn thế giới thay đổi, và sau đó bạn sẽ thực hành và dấn thân. Trong suốt cuộc nói chuyện này, tôi đã hỏi bạn tại sao bạn không được dạy về chánh niệm. Tôi sẽ kết thúc với việc yêu cầu bạn chịu trách nhiệm cho cuộc sống của chính cá nhân mình. Nếu bạn tin, như tôi, như nhiều người và rất nhiều người khác, con đường dẫn đến thành công của bạn, con đường dẫn đến một thế giới tốt đẹp hơn nằm trong việc thực hành chánh niệm, hãy yêu cầu các giáo viên và các quản trị viên mang đến các chuyên gia đào tạo các những kỹ năng để thành công. Bạn cần chủ động sở hữu tương lai của mình. Thay đổi sẽ xảy ra là do lựa chọn, không phải do tình cờ. Chúng ta sẽ thay đổi thế giới, nhất tâm tại một thời điểm. Và nó bắt đầu với chính bạn.